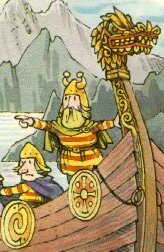 Although he may not be a Nog of great intellect, Thor Nogson, the Captain of the Royal Guard is strong and brave in adversity. He finds the peace that Noggin has brought to the Land of Nog irksome and longs for adventures and deeds of valour in far places. Fortunately these are generously provided by the evil machinations of Noggin's wicked uncle Nogbad the Bad.